Last week, on the Hype machine blog, Anthony indicated his increasing frustration in how easily charts could be manipulated – Anthony wanted a better way, one that was transparent, and gave more influence to the influential. Anthony’s solution was to create a twitter chart that is based on the twittering activity of Hype Machine songs. In this new chart Twitterers with more followers have more influence than those with few. A number of commenters on Anthony’s blog pointed out how it would be easy for a single very popular twitter user to influence the charts. And that is exactly what Erick Schonfeld of TechCrunch did. Erick used the power of TechCrunch for evil. With one tweet from the TechCrunch twitter account (with its nearly 1 million-person reach) he was able to put Rick Astley’s Never Gonna Give you Up at the top of the Hype Machine Twitter chart. Erick writes “The Hype Machine’s formula is flawed. No single person should be able to affect the rankings so easily“. It’s arguable whether or not this is a dishonest manipulation of the charts. TechCrunch really does have a reach of 1 million people – and so by tweeting Rick Astley they are potentially exposing those millions to this song. However, in reality, people don’t read TechCrunch for music recommendations – TechCruch is just not a music tastemaker (sorry Erick). 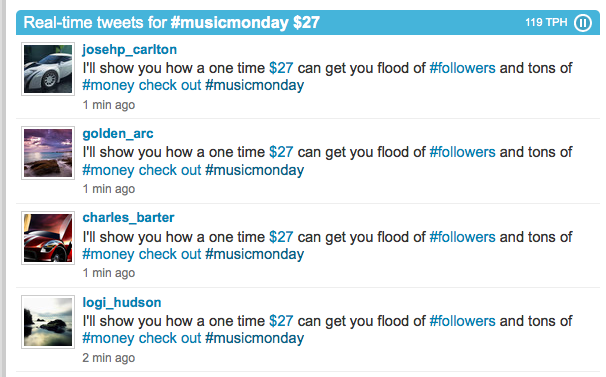 A tweet by TechCrunch counts much less than a tweet by Indie music guide Pitchfork. Anthony should adjust how he scores a tweet to not only include the reach of the tweet but to also include the music reputation of the source. It is not as easy to determine the music reputation as the number of followers for a source, but it is much more important. Some indicators that a tweet has real influences are whether people actually click on the link and listen to the song and whether the poster actually listens to music, especially new music, before it gets popular. I suspect Anthony will be tweaking his scoring algorithms soon to make the charts better reflect what real music listeners are listening to, not just what popular people are listening to. Update: Anthony has responded in he comments. This entry was posted on July 12, 2009, 8:16 pm and is filed under Music, recommendation. You can follow any responses to this entry through RSS 2.0. Both comments and pings are currently closed. A short time after, Mashable also tweeted a track, restoring order, so while it is true that high-powered Twitter users can alter the charts, that’s also part the intent behind making the chart interactive. The idea behind the chart is to engage as well as to inform passively. It is most people’s assumption that charts should merely report what’s going on.